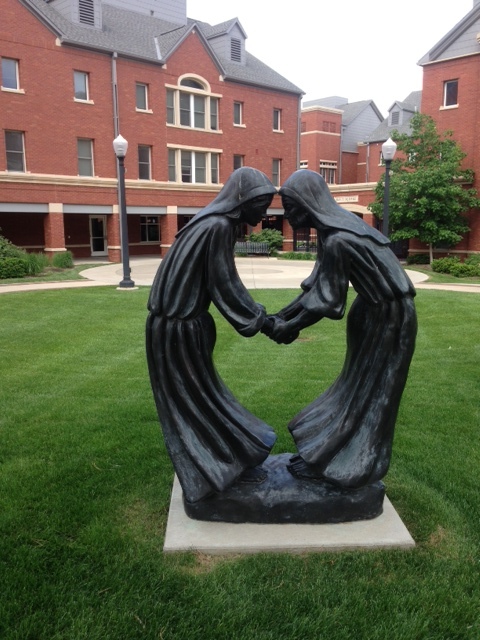 “The Visitation” at Creighton University by Timothy Schmalz. Photo taken by the author at the 2013 CTS Annual Conference. Today we celebrate the Feast of the Visitation. In the story of the Visitation, we encounter Mary and Elizabeth providing bodily hospitality to their sons, extending loving hospitality to one another, and being held in the all-encompassing hospitality of God. And their witness invites us to consider how we extend hospitality to others and receive the hospitality of others. First, both Mary and Elizabeth give witness to hospitality through their pregnancies. Mary’s yes to God’s request to be the mother of Jesus is a profound act of bodily hospitality that will forever alter her life. She opens herself to freely participate in God’s salvific work of God at great risk to her own relationships and place in wider society. After saying yes, Mary takes another, more immediate risk and travels a long distance to see Elizabeth, an older relative also miraculously pregnant with her first child. Mary does what many of us do when face grueling challenges or adversity: we seek out the wisdom, affirmation, and comfort of a loved one. In other words, we seek the hospitality offered through another’s acceptance of our vulnerability and need. And Elizabeth does not disappoint. She welcomes Mary with open arms and words of joy and affirmation. Just imagine the relief Mary must have had felt when she heard Elizabeth exclaim: “Blessed are you among women and blessed is the fruit of your womb!” It must have been much easier to grapple with her life-altering decision with those words echoing in her mind and heart. Then in that space of love and affirmation Mary proclaims the sacred Canticle of Mary, also known as the Magnificat. Biblical scholars tell us that the Magnificat predates the Gospels and was most likely used in the earliest forms of Christian liturgy. With this in mind, the placement of the Magnificat may seem rather odd. It could have just as easily been tagged onto Mary’s “Behold, I am the handmaid of the Lord. May it be done according to your Word” at the conclusion of the Annunciation. Instead, Luke has Mary utter this prayer of prophetic witness—the punctuation of her yes–in the presence of her ally and confidante, a supportive and wise companion-in-pregnancy and faith who affirms Mary’s yes. In the presence of Elizabeth the road-worn, frightened Mary proclaims her prayer of deep conviction that God’s promise lives on; God will not forsake us. Through their solidarity Mary and Elizabeth are held in the fundamental and eternal hospitality of God. In his little book Finding My Way Home, Henri Nouwen reflects on the Visitation: “The visit of Mary to Elizabeth is one of the Bible’s most beautiful expressions of what it means to form community, to be together gathered around a promise, affirming what is happening among us.” (1) The Visitation confirms that Christian conviction that hope becomes easier “where two or three are gathered.” And this is what the Christian community is called to do as we actively participate in God’s work in and through the world. We “gather around a promise”—Christ’s promise of the in-breaking of the Reign of God–faithfully believing that this promise reaches further than Elizabeth or Mary or any of us can imagine. As I write this post, theologians and theological educators from around the country and the world (including several contributors to Daily Theology!) are gathered together at St. Vincent College (a Benedictine college in Latrobe, PA) for the 60th Annual Conference of the College Theology Society. The conference’s theme this year is “Great Work in Us: The Embodiment of Love in Contemporary Consecrated Life and Ecclesial Movements.” This short reflection cannot do justice to all of the rich, exciting, and courageous theological papers and presentations delivered at this year’s conference. But I do want to suggest how fitting it is that a diverse group of intellectually and spiritually committed scholars gather together on the Feast of the Visitation. The intimate story of Mary and Elizabeth invites us to continue reflecting how we can adopt authentic hospitality as a lifelong practice in our family lives, our work, and our prayer. Last evening, after a long and beautiful day of presentations and rich conversation, many conference attendees gathered at Vespers and prayed those words of Mary: “My soul proclaims the greatness of the Lord and my spirit rejoices in God my Savior.” And on Sunday, we will return to our homes, scattered across globe, hopefully rejuvenated in our commitment to embody God’s love through our scholarship, teaching, and prayer and extend the same hospitality we received to all of our brothers and sisters as we all wait in joyful hope for the coming of our salvation. 1. Henri Nouwen, Finding My Way Home, (New York: Crossroads, 2004), 102-3. 2. John C. Haughey, SJ, Where is Knowing Going? : The Horizons of the Knowing Subject, (Washington, D.C.: Georgetown University, 2009). See chapters 1-4 for a detailed look at his understanding of intellectual hospitality and catholicity as embodied in faculty at Catholic colleges and universities.